Next in our British Science Week 2018 series, Michela Rampa talks about her student placement at The British Museum, analysing colours in 16th century Indian paintings and assessing light sensitivity. Find out more at The British Museum’s British Science Week event on Saturday 17 March. Hello, my name is Michela Rampa. I am a student from the University of Rome, La Sapienza, in Italy where I am studying to become a museum scientist. I am currently doing a student placement at The British Museum for my final dissertation. What a fantastic opportunity! At The British Museum I am based in the Scientific Research Department but also regularly meet with conservators. I am learning how to assess whether museum objects might fade when exposed to light using “microfadeometry”. Microfadeometry is a technique that involves exposing a very small area on an object to an intense light for a short amount of time and recording the colour change on this small area. By comparing the colour change with references, it is possible estimate whether the object is sensitive to light or not. Why is it so important to assess the lightfastness of museum objects? Many museum objects are light sensitive, for instance: watercolours, prints or textiles. We cannot stop fading from occurring when these objects are displayed, but we can ensure that light-sensitive objects fade so slowly that they will be seen by countless generations of visitors to the Museum in the future. Knowing if an object is likely to fade when exposed to light helps curators to decide how long it can be displayed and under which conditions. For example, microfading tests carried out on Hokusai’s iconic prints ‘The Great Wave’ and ‘Red Fuji’ last year showed that these should be displayed using dim light for a short amount of time (read about it here). I am currently investigating the lightfastness of some Indian paintings, which will go on display in the new Albukhary Foundation Galleries of the Islamic World at the end of this year. One of them is a very colourful Hamzanama painting made in 1500. (Hamzanama is a series of manuscripts, most of them illustrated, that narrate the legendary deeds of Amir Hamza, the uncle of prophet Muhammad). It is very valuable and I have identified at least 13 different colours on it! I expected that most colours on this painting were produced using mineral pigments and therefore would not fade. However, I am discovering that, on the contrary, several colours, such as green, are light sensitive! I am hoping to perform more analysis to find out why these colours are affected by light. Work in progress! In the meantime, if you want to know more about the work scientists do at the British Museum, please come and find me and the rest of the Scientific Research team at our annual event ZOOM IN: a closer look at science on Saturday 17 March 2018, 10.00 – 16.00, in the Great Court at The British Museum. Learn about all of the different techniques that are used to analyse the Museum’s collections, handle different kinds of raw materials and see the latest behind-the-scenes technology in action. This is a FREE event too! Michela can be contacted by email and on LinkedIn. You can find out more about the upcoming Albukhary Foundation Galleries of the Islamic World on The British Museum website. From the outset my background has been a mix between science and heritage/archaeology. I have a BSc in Archaeological and Forensic Sciences from Bournemouth University and a MRes in Heritage Science from UCL. I am currently developing my skill set further by working in a training capacity for the National Trust, as a Preventive Conservation Fellow. This position is co-ordinated by the Institute of Conservation and funded by the National Trust. What’s you role at the National Trust? My role is a training position based within the National Specialists section, which as you can guess from the name means I am in a very good position to learn a great deal from specialists in conservation and curatorship. I mainly focus on the environmental aspect of preventive conservation which involves using scientific techniques to monitor the relative humidity, temperature, light as well as pests in many of the National Trust properties. This monitoring, along with specific research projects then develops to inform and provide solutions which promote the care of our collections and prolong their life while still allowing them to be displayed to the public. 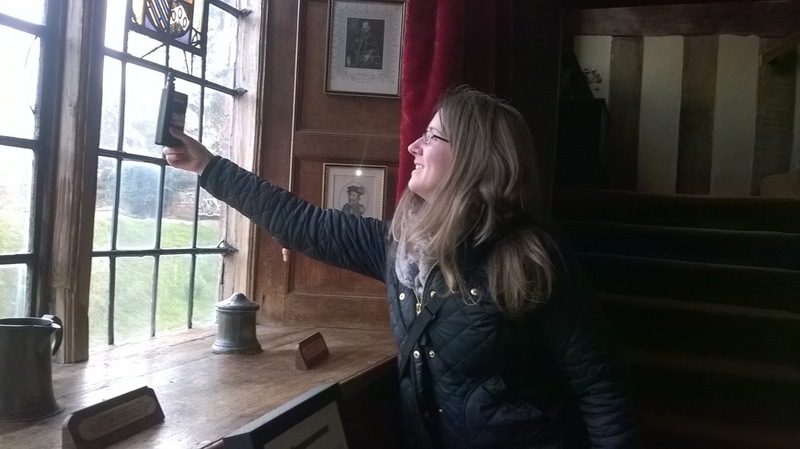 Monitoring light levels at Baddesley Clinton, where a removable pane of UV absorbing perspex has been fitted to reduce UV radiation. It doesn’t detract from the view of the stained glass and avoids the direct contact of adhesive UV films. I am currently involved in a study to monitor colour change on a late 19th century tri-fold screen at Clandon Park which has historic photographs displayed within it. I have a real admiration for those craftsmen of the past who had the skill and vision to create the amazing objects that myself and my colleagues work to conserve. 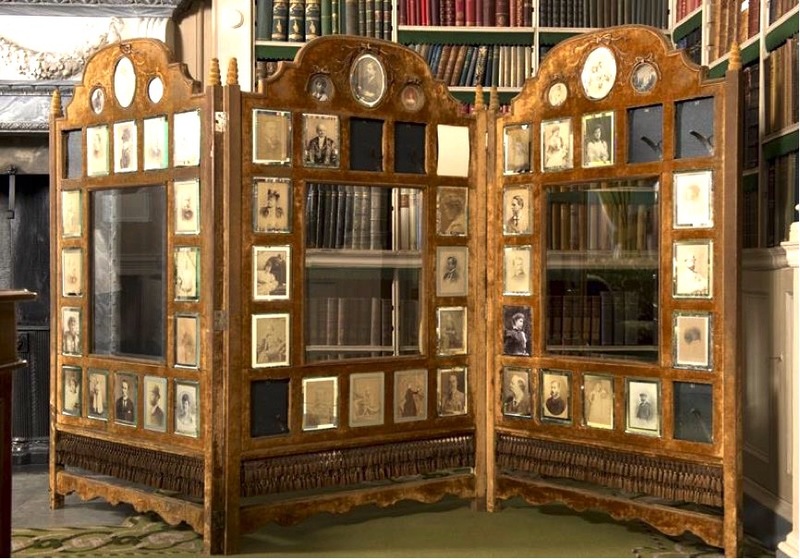 The immense intricacy of these amazing collections becomes more and more apparent once you begin to analyse them. The best example of this was during my MRes research which involved the development of a non-destructive technique to predict the strength of wool yarns in historic tapestries. Checking a blue wool dosimeter in a National Trust Property. The dosimeters are replaced annually and by analysing their colour change we can estimate the light levels that objects are exposed to. 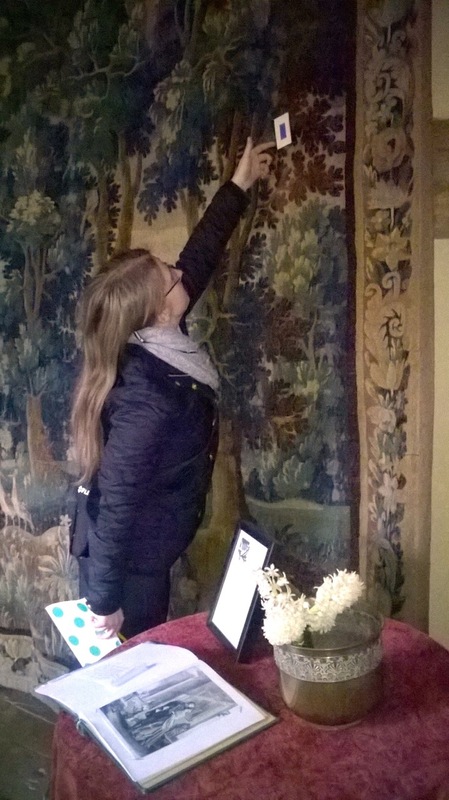 I worked closely with Historic Royal Palaces science team, who funded my project, to investigate the Tudor tapestries and I was constantly overwhelmed by the abilities of the weavers to work with such fine treads to create beautiful images on such a scale. What’s more, the fact that they are still hanging today is testament to the quality of the craftsmanship involved and one that should be celebrated and preserved. I would say it is being able to help people. I get such satisfaction from answering a phone call from someone at a property and being able to advise them using my scientific knowledge to assess the issue objectively. In a single sentence, tells what’s great about heritage science? The ability to apply scientific techniques to real-life issues that really make a difference to how magnificent collections and buildings are preserved.